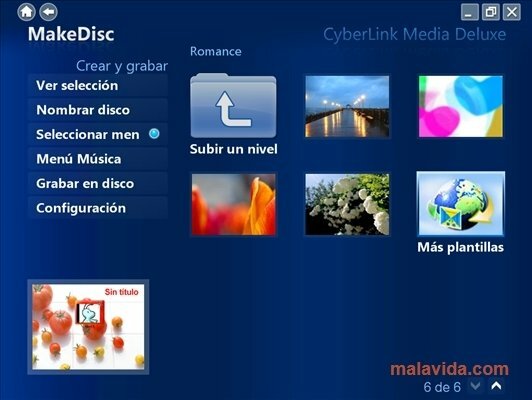 Cyberlink is one of the most important multimedia software development companies of its sector, their DVD player is always one of the top when it comes to making the most of using new hardware and software, that is why we should pay special attention to this CD and DVD burning software, MakeDisc. 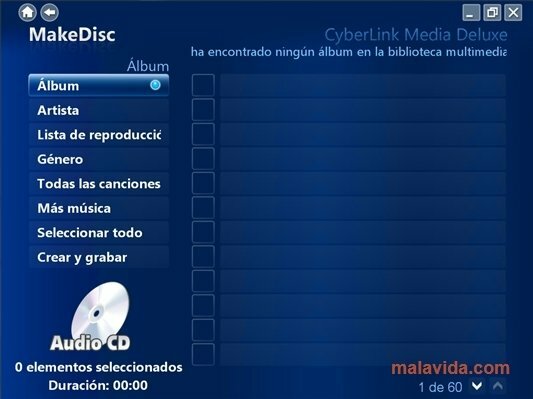 With MakeDisc, Cyberlink puts at our disposal a complete application that will allow any user to burn a whole array of different types of disc on which they will be able to include videos, films, TV series, video clips, music (including converting to Audio CD a bunch of MP3 or WMA files), and, in short, any kind of multimedia file. MakeDisc's interface is really simple and accessible because it is very similar to that of the renowned Window Media Center, it occupies all the screen with big menus and just the options necessary to avoid confusing the user. All we have to do is select what we want to burn, the unit, the design and little more, assuring that any user can use it by just shear intuition. So now you know, if you want to burn CDs and DVDs in an easy way without leaving aside compatibility, MakeDisk can be the perfect choice.